Australia’s impotence in influencing events in its own backyard is being demonstrated in dramatic fashion this week as the Fijian dictator, Frank Bainimarama, fulfils his long-held ambition to assume the chairmanship of the Melanesian Spearhead Group. All of the other Melanesian leaders – from Papua New Guinea, the Solomons, Vanuatu plus the Kanak FLNKS from New Caledonia – are joining Bainimarama for the MSG summit in Suva on Thursday. It’s also being attended by official representatives from Indonesia, East Timor and -strangely – the European Grand Duchy of Luxembourg, which has no Pacific interest whatsoever in the normal course of events but is also about to deliver its own slap in the face to Australia. But more on that later. The humiliation for Australia and New Zealand comes with the authority Bainimarama will now wield as the leader of a virile regional grouping – backed, incidentally, by the Chinese – that’s increasingly regarded as more important than the long-established Pacific Islands Forum, which links the MSG members with Australia, NZ and the smaller island states. Australia and NZ managed to get Fiji suspended from the Forum two years ago because of Bainimarama’s 2006 coup. But now, the regional “bad guy” gets to be the top guy in the MSG, strutting around as chair of an alternative grouping that’s certainly much more representative of the Pacific’s biggest players and biggest populations – the nearly seven million people in PNG and 850-thousand in Fiji. When Fiji was suspended from the Forum in 2009, Bainimarama mocked the then Forum chair who made the announcement – Toke Talagi, the prime minister of Niue – as a stooge of the Aussies and Kiwis. Whatever the truth, Talagi represented a population of just 14-hundred or barely three fully-laden jumbo jets. And those other Pacific leaders who support Australia and NZ’s hardline position on Fiji – notably Samoa’s Tuilaepa Malielegaoi – are also the Pacific’s small guys, however impressive their individual physiques may be. Last year. 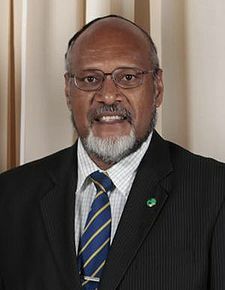 Australia managed to derail Bainimarama’s first attempt to lead the MSG by persuading the then chair, Vanuatu’s former prime minister Edward Natapei, to cancel the Suva summit, where he was scheduled to hand over the leadership to the Fijian leader. Natapei pulled the thatched mat from under Bainimarama’s feet with a Friday news release that didn’t reach Suva until the Monday morning of the week the summit was to take place. Bainimarama cast this as an unforgivable stab in the back from a trusted fellow Melanesian. But he succeeded in turning humiliation into triumph by recasting the MSG summit as an “Engaging with Fiji” summit and attracting every Melanesian leader other than Natapei, most importantly the veteran founding father of Papua New Guinea, Prime Minister Sir Michael Somare. The Fijian leader was thus able to claim that Australia and NZ had “egg on their faces”. It was no exaggeration. Since then, Bainimarama has managed to use Fiji’s diplomatic influence and his keen sense of Melanesian politics to first marginalise Natapei and then rely on the Vanuatu leader’s chief political opponent, Sato Kilman, to destroy him. Much of Kilman’s campaign against Natapei was based on casting him as a man in the thrall of the Aussies and Kiwis who was prepared to betray a Melanesian brother in exchange for more than 60-million dollars in Australian aid. Whether or not the charge was justified, Melanesian “big man” politics is notoriously unforgiving. Natapei has since been consigned to the electoral dustbin and Kilman thereby removed the one remaining impediment to Frank Bainimarama assuming the leadership of the MSG. Australia and New Zealand – the region’s big boys – lost both the battle and the war. Even members of Australia’s foreign affairs establishment now concede that on top of his 2006 coup, Frank Bainimarama has successfully scored another coup in securing the MSG chair. Jenny Hayward-Jones is a former Canberra diplomat who’s director of arguably the region’s most influential and certainly best funded think tank – the Myer Foundation Melanesian Program at the Lowy Institute. Once in the front line of the cheer squad urging Australia and NZ to apply the strictest sanctions against Bainimarama, Hayward-Jones appears to have had a dramatic change of heart. Describing the Fijian dictator’s victory in securing the MSG leadership as “a real coup”, she’s now urging an urgent re-evaluation of Australian and NZ policy towards Fiji. Hayward-Jones has been especially critical of Australian foreign minister and deposed prime minister, Kevin Rudd, who she says is “courting new friends in North Africa” with his campaign for a no-fly zone over Libya while presiding over “an erosion of Australian influence” in the Pacific. Canberra, she says, has “failed to notice that China’s influence is increasing across the Pacific”, becoming the second largest trading partner in the region after Australia, and that “Australia has a lot of catching up to do if it wants to continue the dominance that it once enjoyed in the region”. Of course, many others – including this Fiji-born correspondent – have been saying the same thing for some time. The difference is that Hayward-Jones is a Canberra “beltway insider”, and is doubtless speaking for a lot more than just the Lowy Institute in raising her concerns about Kevin Rudd’s priorities. Official Australian attitudes on how to deal with the Fijian dictator are now split between the hardliners and those like Hayward-Jones who argue the policy isn’t working when Bainimarama winds up heading the MSG and is, in fact, counterproductive in driving him into the arms of the Chinese. Beijing isn’t just getting a significant strategic and economic foothold in Fiji with the deterioration of Bainimarama’s relationship with Canberra and Wellington. The Chinese are also cultivating the MSG to the extent of funding its secretariat in the Vanuatu capital, Port Vila. Hayward-Jones is right. These developments present a clear and present danger to Australia’s interests in the region. It certainly seems an extraordinary paradox that while some of its strategic defence planners are urging Australia to arm itself with US nuclear submarines to counter a perceived Chinese threat, Canberra should be so cavalier about its relationship with a budding Chinese satellite like Fiji. But is there any sign of policy change? Evidently not, judging by the recent comments of Kevin Rudd. During a visit to Wellington at the weekend, the Australian foreign minister was clearly irritated when a TVNZ interlocutor asked him if it was time for both countries to revise their attitude towards Fiji. Rudd refused to answer the question directly, saying there was often a tendency to focus on what Australian and New Zealand diplomacy should be doing rather than putting the onus on the Bainimarama regime. It was the Fijian leader, he said, who had to change and the trans-Tasman partners would continue to be vigorous in calling for democracy and “were not in the business of legitimising” what had been “a very ugly military coup”. So what Canberra insiders have long termed the “Rudd block” in achieving any change in current policy towards Fiji continues, whatever the strategic pitfalls. For his part, Frank Bainimarama simply doesn’t care. 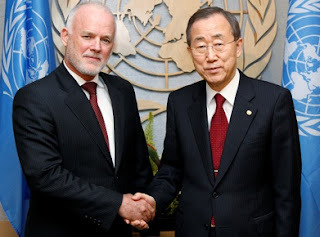 The triple Australian-Fiji-NZ citizen he hired as his UN representative, Peter Thomson, has forged a new network of international relationships for Fiji outside the Anzac orbit, including membership of the Non Aligned Movement. This goes a long way to explaining Indonesia’s presence as an observer at this week’s MSG summit, however much it offends Bainimarama’s Melanesian brothers in the Free Papua Movement. And Thomson has also been a prime influence behind the formation of a formal independent Pacific voting bloc at the UN, which goes a long way to explaining the otherwise inexplicable presence of Luxembourg at the MSG summit. This tiny European state of just over half a million people has the kind of big aspirations that Frank Bainimarama finds irresistible, way beyond its membership of the European Union, where it could clearly be a crucial ally for Fiji. Like Australia, Luxembourg wants a temporary seat on the UN Security Council. And how do you get that? Well, you go lobbying to the four corners of the earth. 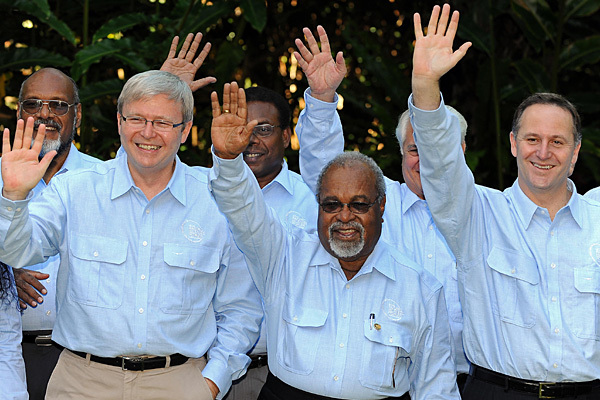 So while Kevin Rudd traverses the length and breadth of Africa trying to secure Australia’s seat, a group of suave Europeans from a place famous mostly for being a refuge for funny money have appeared in the South Seas to roger the Aussies in their own backyard. You can bet they’ll be downing lots of kava and slow-cooked pork on a nod and a wink from the beaming dictator that Fiji’s precious vote will be theirs. It’s a funny old world – and Frank Bainimarama is getting the last laugh. This article by Graham Davis has subsequently appeared in The Australian, the Fiji Sun and news websites throughout the Asia Pacific. How can it be that Egypt's military interim regime can organise elections for 80m people within a year of the fall of a despotic reime with a poulation largley rural with limited educational oportunities but Fiji requires 8 years of 'reform' , and even then elections to be held with conditions. How is that ?? Eactly how special are Fiji's circumstances and how must people feel to be portaryed as ignorant and easily manipulated that they need so much time to get their heads around the concept of a particular kind of democracy that appears to be specifically designed for fiji?? Frank Bainimarama has his eye on the Presidency and Aiyaz Sayed Khaiyum on the Prime Ministership. Once intrenched, the GCC will be disbanded and next to go will be the RFMF, which no doubt will be replaced by Secret Police Force, similar to that of Iran and other Moslem Countries. Welcome to a new Islamic State, Fiji. All the while, Graham will continue along his merry way supporting Frank Bainimarama, oblivious to the bleeding obvious. Mark get your formulae right…………thanks GRAHAM continue to highlight the Fiji Reform through the Bainimarama government, it will happen. My friend, what drugs are you on? Why don't you educate yourself Sara'ssista by spending time in the village visited recently by Bainimarama with several dozen horses for their means of transport. While there obtain the facts on the decision making processes at village level then report back to the digital savvy world. Good luck. Remember, you'll need a horse. Frank and Aiyaz are after your Chief’s complicity and resources and land only. He doesn’t give a toss about the people, he has absolutely no allegiance to anyone except Aiyaz. Haven’t you heard of the arrests of Mara and Driti and others ? Frank is such a coward, he even has to be in vietnam while the arrests take place. If that’s the sort of leader you want, then you deserve him. Hi Graham, spotted this on PNG Attitude. A vexed issue no doubt and no easy solutions. Our troubled neighbour to the North also throws up regular conundrums, especially attempts to water down the leadership code and the role of the Ombudsmen Commission. I guess Bainimarama doesn't need to worry about such things…It would be great to hear from you and perhaps get together in Sydney town. Try and talk some sense into Graham and tell him to open his eyes and ears will you ? Ask him why is he supporting a person who has alleged to have committed sedition and murder and High Treason ! I wouldn’t mind asking him myself when he visits Sydney. Without Frank’s intervention (which we “on the ground” people termed it), where would Fiji be now – “on respisotory machine – aid”. When the politicians & businessman continue to corruptly milk the government coffers. Is this something Mark you need to know, or are too dumped to ask the real reason. Judicial machinery is crunching and the numbers are marching into prison cells – do not be surprised to see your champions of democracy join the queue………thanks Bai. excatly who are they allowed to complain to, certainly not the media. The point is the great divide between those with and those without, and the divide between conditions in Egypt and conditions in Fiji. You're right such villagers have been easily manipulated in previous so called democratic elections and whether the 'military will require them to vote for their stooge' is yet to take place. Bainimarama was the first Prime Minister to visit that isolated village despite the number of democratically elected governments we've had.Complaints can be made directly to the Prime Minister's mobile. He’s not the Prime Minister, he’s just a thug hiding from charges of Sedition and his alleged involvement in or ordering of, the murders of 5 CRW Soldiers in 2000. Giving people access to a Mobile Phone doesn’t mean he is accessible and as for visiting the Village, he said he was going to walk but went horseback because he was too lazy to walk. He’s not even a man of his word, has thrown Fiji’s Economy into disarray and all but destroyed the FNPF, Fiji’s Retirement Fund and squandered billions of dollars in Development Grants and Tourist dollars and potential Investments. Time to open your eyes. And if they are not happy with the outcome, as far as this regime is concerned you are with them or against them. So apparently unhappy villagers who expect a vote soon can go to hell. But they will at least have plenty of manure. Unhappy villagers go to hell only in your black and white mentality. I'm ignorant of the usefulness of horse manure to villagers but cow manure is well known for its multiple uses among Indo Fijians. The information I have is that locals are still ignorant and being treated appallingly by this regime given they have no alternative other than listen to a compliant media spewing out regime media releases. Why hasn’t Graham done a follow up story on this, reporting that the meeting was in fact a farce and a failure ? If I’m not mistaken, didn’t the representative from Vanuatu lose his job thanks to a no confidence motion against him because, against his own parties wishes, he supported the Indonesian request to be an observer at this very same MSG Meeting in Suva ? Come on graham, where is your sense of fair play ? I’ve watched many of your great reports over the last 30 years, but you seem to be smitten by Frank Bainimarama. Open your eyes mate, there is none so blind as he who will not see, none so deaf as he who will not hear. When RUM reached Tonga.one of his immediate demand was for the governments of Australia and NZ to stop their people coming to Fiji as tourists.Has he ever thought of where and how he is going to employ those either directly or indirectly work in the tourism industry for their livelihood,their families,children.Most of these people know of no other work than on these hotels.Words of a desperate man with limited knowledge of the reality of life who cannot even care less for an abandoned wife.As we progress daily,we can see how shallow you think and speak out and useless your thoughts.Remember that you were drafted into the military in ’88 because of your dad,your educational qualification was below requirement.You are the youngest colonel on record in Fiji(proof of my point above)All the best in your new country,Fiji does not need you!!! In view of your support (with which I fully agree) for a Fiji in which all races are equally treated, I’m intrigued by the fact that you made several references to race in your article #18 – all of which implied race is (or should be) be a binding factor in decision making or expectations of behaviour. “…however much it offends Bainimarama’s Melanesian brothers in the Free Papua Movement”. Race is quite obviously a fact of life, but by implying political decisions should be made on the basis of race you seem to merely foster the existence of racism – in this article at least. Your disapproval of Mr Natapei’s actions should surely have been predicated on the fact that you thought he was wrong – not, as you seem to gratuitously imply, by the fact that he’s got similar physical and cultural characteristics to Mr Bainimarama. It certainly seems that by inviting the Indonesians as observers (to the chagrin of his ‘Melanesian brothers’) Mr Bainimarama managed to avoid the trap you fall into. In his book political expediency rules, no matter what the shade of skin or slant of eye. I wouldn’t have bothered to raise the matter had it appeared once or even twice – but three times in one article couldn’t go unremarked. Try changing ‘Melanesian’ to ‘Indian’ or ‘European’ and you’ll see what I mean. On a different point it’s amusing to read how one man’s status on the Pacific stage waxes and wanes in accordance with your view of his actions. Samoa’s Tuilaepa Malielegaoi is a ‘Pacific small guy’ for supporting Australia and New Zealand (in this article) yet just 8 weeks and 12 posts later (#30) he’s grown to be an ‘influential, mainstream Pacific leader’ calling for tougher sanctions on Fiji. Dear, dear Jon, your life must be even more lonely and miserable than mine to have gone through my previous scribblings with such a fine tooth comb. The Melanesian brotherhood is fact, just as the Italian mafia is fact. Kava or spaghetti and meatballs, it doesn’t amount to a hill of beans. So why on earth would you try to make it into a mountain? There’s a huge difference between stating the bleeding obvious and placing race at the centre of national life as a defining factor, as has happened so unfortunately in Fiji. So I reject your comparison as irrelevant. As for the meddling Tuialepa, it’s true, I once saw him as merely a Pacific small guy. Until the Australians brought him to Canberra and allowed him to call for regime change in Fiji. That makes him a big nuisance, apart from anything else, but not much more. You’re right. I was wrong to invest any importance in him whatsoever. The Australian and NZ tough guy poseurs are merely hiding beyond a Samoan big mouth in skirts. No whirling dervish, this bloke, that’s for sure. It sounded like a cry from an almost bottomless depth of despair as you confessed to leading a lonely, miserable life so my sympathy goes out to you. Nevertheless that’s no excuse for being wrong, as you are when you write Melanesian brotherhood is a fact, yet spend part of your article demonstrating how it’s not since political expediency is – as evidenced by Bainimarama and Natapei in different situations. They didn’t place race at the centre of life but you did in your article, which is why I asked the question. From your flippant non answer I can only assume you overindulged on that hill of beans. Still, thanks (not) for leaving me with the mental image of Tuialepa whirling like a dervish in his lava lava. I hope the Samoans are more modest than the Scots. No matter what the world said about the great Honorable Bainimarama in his many faces, the world should now be informed and re-affirmed that the root course of what transpired in Fiji in late 2006 was the culmination of dirty politics like riggiNG THE GENERAL ELECTION OF 2001 and 2006.It was even earlier done by SVT Rabuka Gvt. The overseas supported and well coordinated Rigging of Fiji General election in 2001 and 2006 has seen all parties paying a huge and ever increasing prices. Even most of the religious organisation plays a part in the masterminding of this evil Satanic Act that no one even the most honorable christian pastors cannot confess to the trueth of rigging.An intolerable SIN under Gods command. The penalty of such state SIN will see Fiji or any country for that matter paying the rpice for life.HELL is the end.There is no future solution .You start the monkey game you will end like a monkey and all those who want to clean it will also fall into the monkey trap.